I really liked this movie, but I have to say that it did not have the "magic" of harry potter and I did not enjoy the ending. Not that true to the book ether.Don't get me wrong I LOVE harry potter and I loved the movie. Was very exciting and engaging, can't wait for the next one. 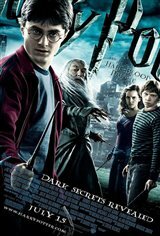 I am a big fan of Harry Potter and I just would like to say I really enjoyed this film, But i do not recommend this for younger children. This movie ROCKED!!!!!! It was EXACTLY the way I saw it in my mind after reading it.... You FOOLS who thought it was bad, do not know a good movie if it bit you in the assssss Get a brain and smarten up...It was AMAZING, and only Harry Potter can be this AMAZING!!!! !